The original BackPack was like many Twelve South products in that it was an incredibly obvious product produced with a high level of polish. 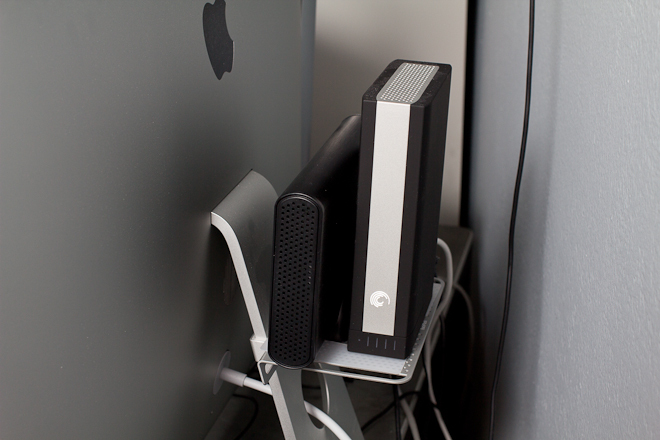 Adding a shelf to the back of your Mac to store hard drives and other knick-knacks may have seemed like a no-brainer, but the BackPack was the accessory that nailed it. The BackPack 2 keeps the core behavior of the first model and adds a few small tricks of its own to entice you if you haven’t already made the jump. 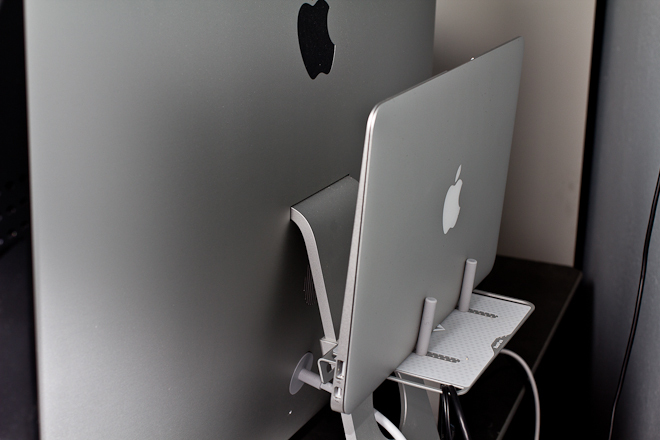 In addition to mounting on the back of your Mac, it will also mount to the front of the support pole on Apple Displays, creating a forward-looking shelf that you can use to store things off of your desk. Since I don’t have a separate Apple display, it wasn’t practical for me to test that out, as a 27″ iMac has very little clearance underneath and a shelf wouldn’t be convenient. I was, however, able to test the other two new features: the ability to store items vertically and some new cable management rails along the sides. 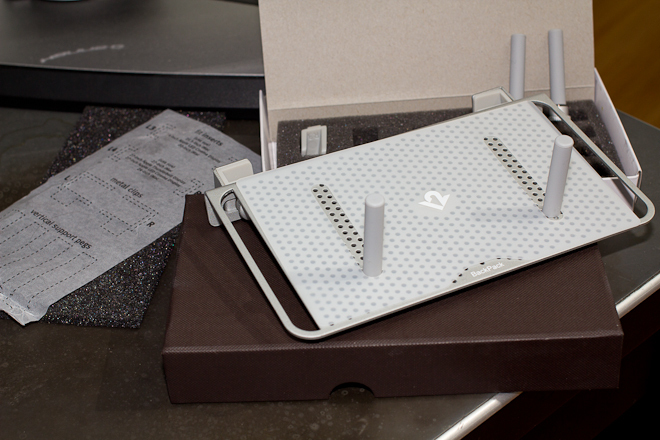 The BackPack 2 comes in Twelve South’s trademark posh packaging, which is always done so well. When you remove it from the textured box, you’ll see two clips, two sets of inserts, four vertical support posts and the shelf itself. An instruction manual and a parts diagram are inside as well, so you know exactly which inserts are made for which displays. The clips are designed to slide along the rear rail of the BackPack, letting you place the shelf anywhere you like. They’re set so that they only go one way, acting as a wedge that tightens when weight is applied. The inserts also apply torsion to the support beam as you set items on it, so I experienced very little slippage issues when attaching the shelf. I do wish that the screws had a place to use a driver on them, as I would like to clamp them down a bit tighter than my fingers can do. 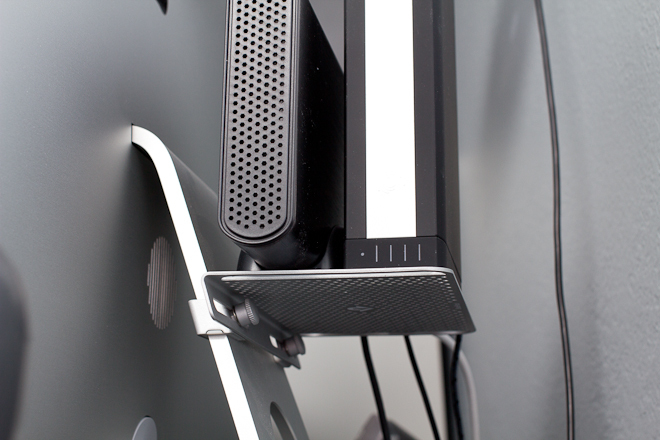 The posts are inserted through any of the perforated holes on the shelf, which also act as ventilation. If you’re using drives that are metal-to-metal, there’s a handy rubber mat included, but ditch it if they’re in enclosures, as you’ll get better heat passthrough that way. Once you’ve shoved the poles through, you can tighten them down with the thumbscrews. 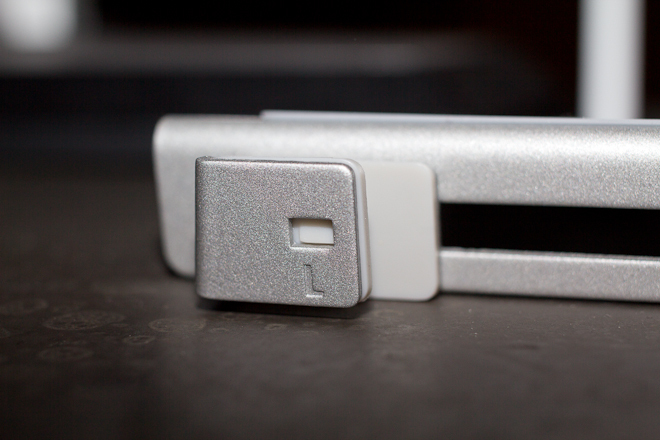 Once again, the thumbscrews could have used the ability to…well, screw them. But they go on ok after a bit of tightening. 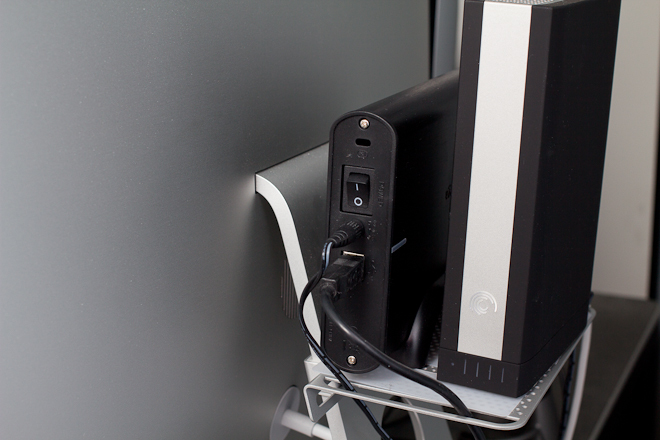 The shelf is easily big enough to store two vertical drives, which stay on just fine even without the support posts. The rubber mat actually does help with slipping here, especially if you tend to move your desk a lot when you type. If you’re concerned about them tipping off, you could use two posts as a retaining wall along the outer edge. When using four poles, two front and two back, my MacBook Air stood up just fine on the shelf. The maximum weight is 3.5lbs, so larger laptops like the 17″ MBP or the like are out of luck, but 13″ MacBooks or Airs are no problemo. In the view above you can see how the shelf is attached, with the screws and the cantilever holding the clamps tight against the support beam of the iMac. 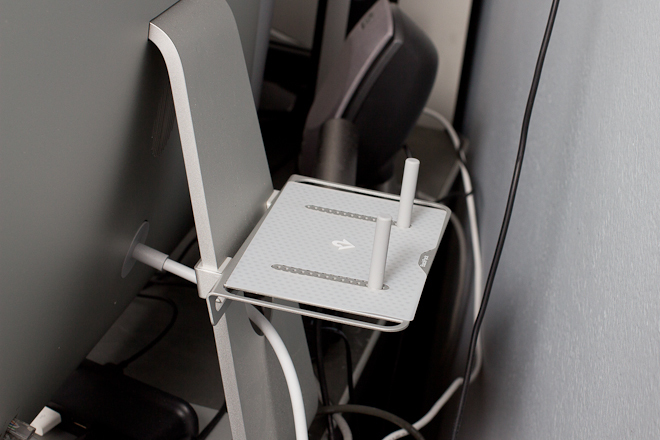 As I said, no slippage issues, even when moving the desk around while shooting images and testing. 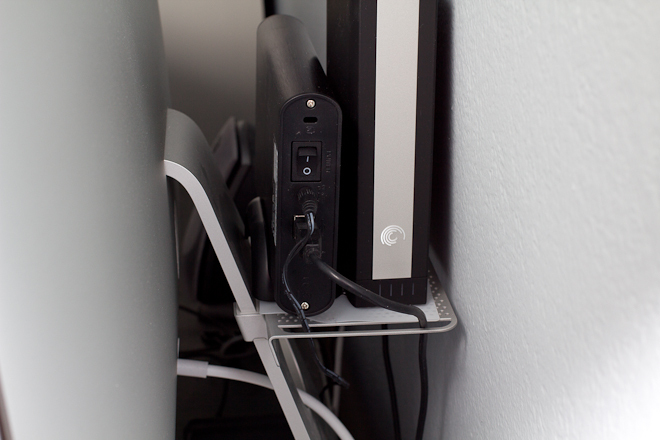 The new rails along the sides allow you to slip cables through them to keep them in order, which is handy if you’re using the shelf to store drives. They work just fine, and routing them through the rail and then through the hole in the support beam works quite well for keeping short 3ft cables in order. One issue I had with the BackPack 2 in my setup was that I keep my iMac very close to the wall, with the beam almost touching it. Because of the rear clearance, I had to move my iMac away from the wall onto my desk. This screwed with my head because I like to have a certain amount of distance away from my screen when I’m using my big iMac. So I had to scoot my desk out from the wall about an inch and then move my iMac away from me to keep the same distance. Obviously a lot of that has to do with my particular brand of neuroses, but I thought I’d tell you. Don’t judge me. Update: The Twelve South folks were kind enough to note to me that if you push the shelf all the way to the top of the support bar, there’s enough clearance to push it all the way back. The BackPack 2 is a fitting sequel to the original design, with well machined aluminum that matches up closely with the finish of the iMacs, Apple Displays and MacBooks that it’s designed to be used with. All of the parts are carefully done, with rubber coatings on the support posts and ridged grips on the screws. Aside from not having any way to tighten the screws with a tool, I couldn’t find a lot to dislike about it. If you have no external drives or any other crap you’d like off your desk, hey, I understand, but I don’t think I like you very much. Just kidding. But, if you have an original BackPack, the cord management and vertical storage might be a good reason to drop $35 bucks, and if you don’t have one, there’s really no reason not to snag one at that price.